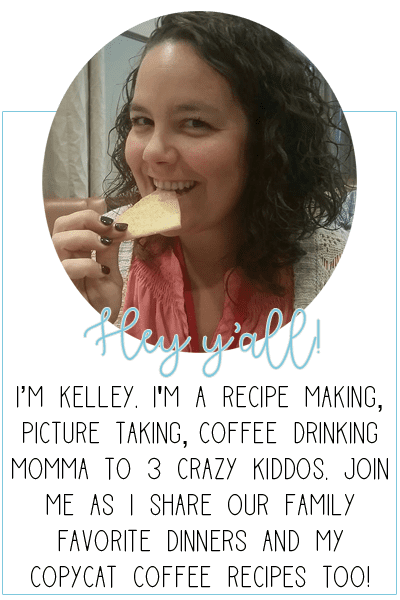 I have a confession to make – I hate cleaning my microwave. Like its one of things that I try to forget needs to be clean because I just don’t like to do it. [Anyone else do that? Say yes, please!] I have gotten really good at turning a blind eye to how dirty and nasty it gets too. That butter that splashed, the spaghetti sauce that popped, that stuff that is crusted to the top. Yea, all that stuff. Then my mom told me it was time. Time to clean my dirty microwave and she even showed me how to do it naturally! Check it out below. First, yes. That top picture really is my nasty microwave. I told ya, I got good at ignoring how gross it was. [Sad but true.] Second, yes. 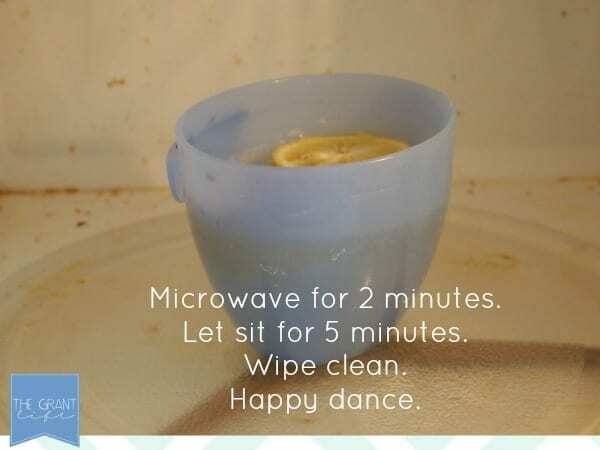 All you need to clean your microwave is a bowl of water and some lemons. Kinda cool, right? No harmful chemicals, no spraying the whole thing down and watching it run down the microwave sides. None of that. Set your bowl with water and lemons in your microwave. “Cook” for 2 minutes on high. Leave the microwave shut after for an additional 5-ish minutes. This allows the steam to loosen all the dirt and food that has been hanging out in your microwave. [And if your microwave is like mine it keeps beeping to let you know its done. Just ignore it. Go to your happy place for a few minutes.] Use a cloth or green scrubbie and clean out all the gunk. Insert happy dance here. 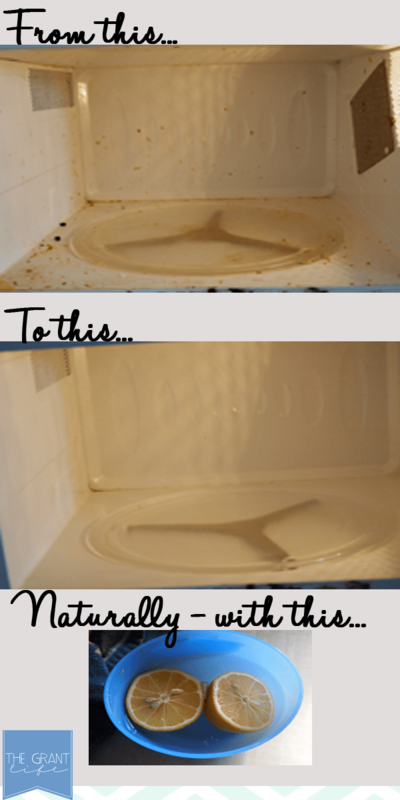 There are two things I learned using this method to clean my microwave. First, that you still have to scrub to get all the goop off the inside. I thought that everything would just kinda fall right off and I could wipe it clean. Nope. You still have to kind of work at it. Second, I had to clean my tray separately. Its tempered glass so it didn’t really take to the steam or the lemons. I took it out and cleaned it in the sink. No biggie, just wanted to give yall a heads up. Yay! And I didn’t believe it at first either. I thought “no way, mom.” But it worked great and my kitchen smelled like lemon most of the day! So glad you tried it!